Pub in Leyton, next to St Patrick's Cemetery and fairly near Leyton Station. It has two separate bars, each with their own entrance. The public bar has a pool table, and the lounge bar has a dartboard (with Courage Best branding). There's also a pleasant back garden and upstairs function room which is often used by the Masons. Decor in the lounge bar is traditional, with a patterned carpet, high ceiling, tankards hanging from the ceiling beams, and horse brasses mounted in a line up the staircase. The fireplace boasts even more horse brasses, as well as some nice old flowery tiles and a cat sculpture lying asleep in front. Seating is upholstered banquettes, low bar stools, and upright chairs. Real ale is served, including an own-branded "Rita's Special". According to a sign seen in August 2014, bar snacks are available 1pm-4pm, with sandwiches and wraps made to order. On Kake and bob's visit on a Wednesday late evening in May 2011, the interior was notably brightly lit. Service was friendly and informative. Music was playing occasionally — perhaps a jukebox? Kake visited again on a Friday afternoon in August 2011. There was again occasional music. Three of the seven handpumps were on, including "Rita's Special". A half of lime and soda was 40p. In contrast to my previous visit, service was perfunctory, with no acknowledgement when I walked up to the bar and no eye contact throughout our interaction. There were quite a few people in just before 3pm, but plenty of free seats. According to signs seen in August 2014, the pub is dog friendly photo, and children are welcome until 7pm photo. [Flash]? 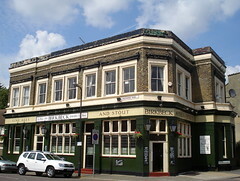 's verdict: Generally accepted by the locals to be the best pub in Leyton and this is evidenced by CAMRA awards. Accessibility: Fairly large steps at both entrances. No further steps to the ladies' (accessed via the lounge bar), but the cubicles are very small. Gents' not checked. Last visited by Kake, August 2014. Opening hours taken from the 2007 Good Beer Guide. Last edited 2014-08-03 14:08:16 (version 19; diff). List all versions. Page last edited 2014-08-03 14:08:16 (version 19).